last week we had an unusually cool tuesday wash over atlanta, georgia, and i insisted we all take advantage of it. 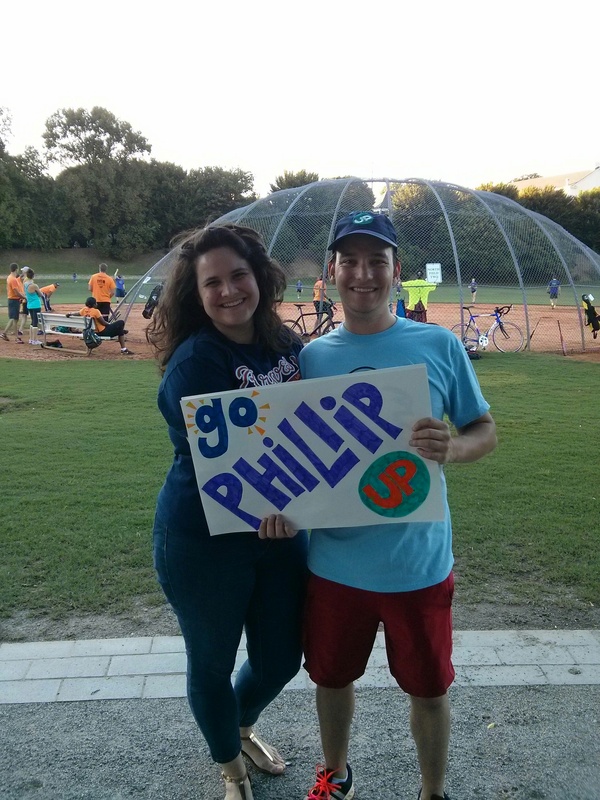 phillip’s company was having their softball game at the active oval of piedmont park, and i convinced clark and kari to join me for a lovely evening in the city. despite the fact that the opposing team never showed up, we still had a fabulous time together. i thoroughly embarrassed phillip with my cheering and jeering as he was up to bat and out in right field. his coworkers looked at me on the bench and laughed, hopefully out of humor more than anything else. although it was a forfeited win that night, it was a win nonetheless, so there ya go! lefties hit more home runs! afterwards the four of us took a stroll across the street and enjoyed a lovely dinner al fresco at the nook for some world famous totchos and beer. as i took in the other patrons, i was overwhelmed with joy at the weather. i cannot recall how many times i said, “how gorgeous is it out here? this weather is unbelievable!” i am a naturally joyous person, but when fall comes around, it’s a whole other level of happiness that i cannot contain. i couldn’t help but thinking of u2’s famous song “beautiful day” and how grateful i am for the changing seasons and the Lord’s grace for us on His earth. it’s an amazing thing, isn’t it?